A great variety of Web sites displaying cultural aspects of landscapes exist today. Although built on different design patterns, all these Web sites have to cope with the typical problem of creating a concise but comprehensive representation of a variety of cultural resources within a framework of time and space. In this paper we discuss currently predominant but very different approaches, ranging from an historical GIS and a wiki with Google maps to illustrated HTML-documents and Flash-based visual narratives. We propose a model that identifies generic requirements for spatiotemporal cultural heritage Web sites. The model helps to understand how well different implementation environments suit various objectives. The model is applied to our own cultural landscape portal on the region around the Vecht, a small river which runs from the city of Utrecht to the north, at both sides fringed by a rich historical landscape. A cultural landscape is the product of both the activity of nature and human intervention. It includes historical places, buildings, and other cultural markers, together with the natural environment itself; by the impact of human habitation it has got cultural value as well (Breure et al., 2006). Such a landscape can be considered as a ‘museum without walls’. Clearly defined landscapes designed and created intentionally by man; for example, gardens and parks constructed for aesthetic reasons. a relict (or fossil) landscape in which an evolutionary process came to an end at some time in the past, having significant features still visible in material form. a continuing landscape in which the evolutionary process is still in progress, at the same time exhibiting significant material evidence of its evolution over time. Associative cultural landscapes, areas with powerful religious, artistic or cultural associations rather than material cultural evidence (Rössler, 2003). This paper focuses on category 2b, the landscape with historical value still retaining an active role in society. This category has some inherent information problems. For centuries different groups of people have cultivated their environment. Traces of these activities are deposited in the landscape or have been scattered over various collection holders, like museums, archives, libraries, research institutes, government agencies - even far outside the cultural landscape itself. This is documented by a great variety of spatiotemporal cultural heritage Web sites which we subsume under the general notion of cultural landscape portals. Each of them deals with specific aspects of cultural landscapes, often aiming at a particular purpose that sometimes even lies far beyond the regional scope of the landscape itself. A holistic view, however, seems more appropriate to show the role of a cultural landscape in an actively changing society. Tourism, spatial planning and initiatives to strengthen awareness of regional identity may benefit from an integrated approach. In the Dutch context, for example, decisions on a prominent issue like regional water management require integration of information from many sources and are related to a wide range of issues: land use, preservation of natural environment, cultural heritage, national versus regional spatial planning, and so on. The target audience of these portals is a fleeting group of tourists, schoolchildren, students, architects, town and country planners, governmental administrators and the local population, who do not want to spend hours studying scattered sources and distilling the information they need. These users rather prefer ‘one-window shopping’ and information packages whose essence can be quickly grasped. Instead of long-winded stories, explorative interfaces should be offered, empowering users to integrate information to their own taste and from different Web sites in a transparent way. Many cultural landscape portals came into existence as database-driven projects and still present themselves as structured collections of individual items. Users with limited, factual questions will be satisfied with searching information about a specific location or object. A landscape portal is then the specialized entry point. However, information integration requires more. Ideally, one must be able to read” the landscape in its spatiotemporal context (Birnbaum, 1994; Taylor; 2003; Scazzosi, 2004; Breure et al., 2006). This implies building relations between points in time and space in order to create cause-and-effect-trajectories. This reading will take place on different levels: landscape as nature, habitat, artifact, system, problem, wealth, ideology, history, place and aesthetic. Integration (and understanding) may still require a lot of study in spite of all the information available on the Web. To support this reading process, a cultural landscape portal can help users to find and integrate the variety of scattered information. It may not only provide data, but also explain the landscape’s development. This requires an overview of the area’s full extent, with its infrastructure, vegetation and land use, and a more detailed display of objects and historical locations, in their present state as well as in the previous or future stages. All of these can be linked together by a representation of the processes that underlie the landscape’s changes over time (Breure et al., 2006). Technically, this means an integration of different multimedia objects, including texts, (aerial) photographs, historical and modern maps, and video. This brief sketch leaves us with some thorny questions about content engineering and portal design. Although reflecting different design patterns, all cultural landscape portals have to cope with the problem of creating a comprehensive yet concise representation of a variety of cultural resources within a framework of time and space. Are there any best practices for creating such an integrative view on a cultural landscape, leaving ample room for detailed exploration too? What kinds of design patterns and techniques have proven to be most successful? How are they to be translated to the portal’s architecture? In other words, can we define some architectural principles that solve the typical information problems of cultural landscape portals? In search of a suitable portal architecture, we may learn from existing Web sites. How well do they succeed in presenting an integrated view of their collection? Although we already implied what we mean by integrating cultural landscape information, the notion should be more well-founded before starting any analysis of existing portals. The landscape as substratum of historical discourse is not new. About the middle of the previous century the idea was taken to a higher level by the French Annales school of history. In 1949 the monumental work by Fernand Braudel, The Mediterranean, was published (French title: La Méditerranée et le monde méditerranéen à l’époque de Philippe II – revised in 1966; Braudel, 1966). It comprised much more than a detailed study of the Mediterranean as a cultural landscape: it demonstrated also a theoretical model of geohistory, or, rather a ‘total history’ (histoire globale) based on geographic structures and differences in historical time. The longue durée is a perspective that concentrates on the immobile, the steady patterns of life with its underlying geographical constraints and natural regulating mechanisms related to climate, seasons and social conventions. The moyenne durée (or conjonctures) is about historical processes that develop in cycles like the rise of a trade center. Its time span is about fifty to one hundred years. The courte durée (or histoire événementielle) deals with the short-term events in history and their consequences, like warfare, political actors, earthquakes, famines, diseases (Hufton, 1986). In spite of criticism and revisiting (Clark, 1999; Lai, 2004), Braudel’s ideas are still influential in cultural landscape studies (Barker, 1995; Westerdahl, 1998; Ucko, 1999), not surprisingly because of his integrative approach with emphasis on overview. Maritime archeology, for example, coined the term ‘maritime durée’ to refer to the long-term interaction between humans and the maritime coastal landscape (Rönnby, 2007). Viewed through the lens of the Annales, the dynamic change between centralization and decentralization in the Maya state was explained as a classic example of the contradictions between a long-term structure (kinship) and medium-term (kingship) cycle” (Iannone, 2002). Structures (in a Braudelian sense): geological, geographical, climatological, but also fundamental, stable political and legal structures. Processes: a catch-all term for all those longer-time-related human activities and/or gradual changes in the natural environment that formed distinctive stages of the cultural landscape, like the historical peat extraction causing today’s problems of water management in several Dutch regions. Events concerning objects and locations relevant to the landscape’s history and/or natural development. They have in common that they take up relatively little time or space. Information on this level includes not only the event itself, but also its material cultural evidence; e.g. it contains the fact of building a castle as well as a description of what was built. To symbolize the differences in rhythm, we may visualize the layers in a pyramid shape, like in figure 1. With the help of this model, a portal for cultural landscapes can be characterized by roughly mapping its content on to these levels with some indication of its extent in time and space. The portal’s content will consist of well-organized chunks of information, or topics. A topic in its simplest form can be represented by a short text; however, a cluster of related texts, images, maps, diagrams, etc. will occur much more frequently. In a database-driven system, a topic coincides with a view (snapshot), a particular selection of data. A topic should extend over multiple dimensions. In terms of figure 1, a topic should not be a ‘circle in a plane’, for example, a factual account of events without integrating related processes and structures; also a ‘wall’ or a ‘pillar’ is an undesirable shape, which would imply a historical narrative covering a small time slice, and/or tiny territory. Although publications on such limited topics have their own value, for example in local history, they do not contribute to an integrative view on the cultural landscape as a whole. The ideal shape is a ‘sphere’, a topic that has a balanced integration of various historical levels over a reasonable distance in time and space. In practice we will find, of course, much less ideal shapes. Topics should be connected through content, not only by hyperlinks. Although hyper linking topics is a major step towards integration, users may perceive the shift from one document to an other as an abrupt change. They have to pick up the story line each time a new document is opened. This can be cured by deliberately dividing a topic into two parts, core and context information. The latter will cover related topics in a global or fragmentary way depending on the subject. Principle 1 will automatically encourage a more panoramic style of writing and displaying, in which other topics appear on the horizon. However, contextual connections need not necessarily be made in the text itself. There are many more options to implement this principle; for example, through an interactive map that keeps one part (the overview) static, while another part changes, e.g. through a pop-up window. An interactive timeline (with more information than just names) can also function as a connector and can be used in the contextual part of several related topics. A well-chosen image will also connect different stories, as with the old school wall pictures about farm life or meadow birds which implicitly provide context to the individual objects displayed. Hyperlinks, or any substitute in the form of buttons, clickable maps etc., are still required, but they are always embedded within a content that provides a sort of preview of the topic linked to. This will result in interesting graphical page navigators which replace a simple list of page titles. To summarize both principles visually: in our definition a highly integrated presentation looks like Figure 2. Topics are ideally spheres intersecting one another, rather than balls connected with lines (which represent hyperlinking only). The connector is either the intersection itself (i.e. shared content), or the ball in the middle (binding contextual content). In addition, these spheres should intersect more than one layer, thus combining different levels of history. However, information integration thus defined lacks the important quality of overview or filtering. This is not so much a feature of the content structure itself, but rather a quality of the presentation. It is also highly related to information requirements, which will vary by target audience, and therefore are a rather subjective criterion. Referring to Figure 2, we may say at least that the user should not perceive the portal’s content merely as a multitude of topics. Ideally, users can follow one or more story lines through an information hierarchy formed by connected topics. In our discussion of portals below, this aspect is not rated, since it requires profound and detailed usability analysis. Fig 2: Integrated information in a cultural landscape portal. A large group of cultural landscape portals are based on physical collections of cultural heritage institutions, which vary from museums, libraries, archives to projects, mostly of regional or supraregional character, and which present material from different collection holders. Collections of historical maps form an important category in this group and are sometimes the outstanding representation of cultural landscapes, like in American Memory. There, cultural landscapes are documented by digitized maps viewable through a zooming and navigation mechanism, presented completely with metadata. This is a recurrent pattern, also used by many libraries for their map collections. This type of Web site aims primarily at presenting collections and is not intended as a real cultural landscape portal. The degree of integration is usually low – in terms of our model, it does not go beyond ‘circles in the plane of structures’. Of course, maps may also document historical processes and events, but when presented individually, as static images, one can only see how structures have changed over time, perhaps after printing the maps first. The process itself must be reconstructed by the user himself. A larger integration of map information on the level of structures can be realized by georeferencing maps and by search options using a gazetteer. The Royal Tropical Institute in the Netherlands has brought a substantial collection of colonial maps on-line (Indonesia, Suriname and the Netherlands Antilles); they can be searched by geographical names. Hits are circled on the historical map and can be marked also on Google Earth. Maps may be part of mixed digital collections which include also material like photographs, art reproductions and written documents. This type of portal distinguishes itself from the previous category by its heterogeneous character, but has the same focus on collections, mainly resulting in an equally low degree of integration. A good example is Digital Himalaya, which includes also journals, films, music, photos, texts and census data. Another representative of this genre is the Japanese Historical Map Collection, housed on the Berkeley campus in the East Asian Library. The on-line version is related to the David Rumsey Collection and counts over 1100 images of maps and books. In terms of our model, this type of portal covers all levels of history, but the topics are quite small, granules rather than balls, without connections other than metadata. We understand by reference portals those Web sites whose main purpose is to collect and share information from different sources, and to organize and present it in a certain format; for example, as a database or a wiki or through a geographic information system (GIS). As with conventional reference works like an atlas or encyclopedia, the emphasis is on creating knowledge rather than on displaying collections. Professional information about cultural landscapes is systematically organized in (text) databases like the World Heritage Site of UNESCO and Cultbase, created by PAN, a thematic network on cultural landscapes and their ecosystems. A survey of these institutional expert databases is far beyond the scope of this paper. Digital libraries form a special subcategory; they can also be classified as mixed collections. They contain a wide range of historical sources, both visual material and texts. Most well-known is Perseus, which covers not only antiquity, but also, amongst other topics, the history of London from its founding to the 19th century. Another nice example is the Tibetan and Himalayan Digital Library. It contains a variety of cultural resources, like images, audio/video, interactive maps, a GIS, and a gazetteer which is connected with an interactive map. However, viewing a QuickTime-panorama from Mount Everest, it is impossible to switch to a map or GIS to locate the position. Integration will vary: a lot of content is very well linked, but in other cases isolated documents are displayed and users must find their way to neighboring information on their own. Like mixed collections, these portals cover all historical levels. Following Wikipedia’s popular model, some Web sites sprang into existence and tried to get non-professionals involved. Germany has a Germaniki with information about German cities and towns, and the Kulturlandschaftsportals Thüringen makes an appeal to local populations to participate in a research project on the cultural landscape and to share their local expertise through a wiki. The south-western part of the Netherlands is being documented in the Buurtatlas (‘neighborhood atlas’), which combines a wiki with Google maps. With regard to our reference model, the wikis mentioned tend to focus on the level of events. Because automatic linking is part of the wiki model, one can easily switch topics, but the built-in collaborative mechanisms do not direct the users towards an integrated presentation of content. Because the usage of a wiki implies a great number of authors, a balanced contextual overlap between topics is hard to realize. We use the term ‘geographic information system’ (GIS) in the broad sense of the word, as an information system that handles locationally defined data, not necessarily having possibilities for extensive data analysis. Therefore, software like Google Earth and Google Maps also falls under this definition. Google software makes it quite easy to mark cultural data on a map; for example, archeological excavations, as the Belgian Web site OpGraven does. The award-winning Flemish cultural heritage site Erfgoed in Vlaanderen combines Google Map technology with Flickr, where pictures are grouped and made accessible through various entries. Because many professional landscape organizations, government agencies and research groups tend to create their own GIS to visualize administrative data, it is unfeasible to give a representative sketch of the full range of applications. We shall concentrate, for our purpose, on the most important subcategory: historical GIS, which uses geovisualization as a common framework to integrate spatially referenced data, mainly from serial historical sources. Historical maps can be used as (semi-transparent) overlays to combine different views of a landscape over time. to make historical-geographical source materials available to scholars and to the general public (Knowles, 2005). In the Netherlands, HISGIS documents the history of the northern province of Friesland in this way. The Electronic Cultural Atlas Initiative (ECAI) is a good starting point for an overview of this subcategory. Many of the projects listed are powered by the open source package TimeMap, which allows integration of diverse data resources into a unified structure by defining a conceptual mapping between a spatiotemporal data model and the project data. Maps with timelines and controls are displayed through a Java applet. Areas are made clickable and linkable to any Web resource. Historical processes can be visualized through animations created on the fly, provided the underlying data are suitable for display on a map. ECAI Iraq is an illustration of what can be realized with TimeMap. Data about the Iraqi and Mesopotamian culture is stored in hundreds of Web sites around the world. ECAI Iraq acts as a central access point using time-enabled thematic maps. The time line displays for each period a list of links to Web resources. The interactive maps show the different empires which can be switched on/off, or filtered through a time scale slider. The Web site provides multiple entry points, like a map index and a list plus clickable map of historical sites and empires. Given the predominant combination of maps and database data, one misses sometimes an explanatory historical narrative. An exception in this respect is A Vision of Britain, created by the Great Britain Historical GIS Project. After selection of a location and a theme, the statistical data are introduced by a short text. The site contains also historical maps and – a striking narrative element – travelers’ tales linked to locations. The historical GIS approach has powerful integrative capabilities, in particular with regard to our first principle: a GIS can cover all levels of history and provide an integrated view through a combination of maps, animations, and statistical charts. Its limitation lies with the second principle, that of connecting through content. Integration is fully dependent on the content’s spatial characteristics. A map is the only connector between topics, which are, in this context, views or snapshots. Although ‘gateway’ is often used as a synonym of ‘portal’, we want to reserve this term for introductory portals with emphasis on educational and promotional purposes. Many Web sites in this category are set up by collection holders or cultural heritage sites for the benefit of tourists, schools and the general public. The low end distinguishes itself from typical tourist Web sites by the larger amount of background information supplied. A few examples chosen haphazardly are the French Web site about the Loire valley, Val de Loire, the gateway to the Australian Alps National Parks, and the Jurassic Coast Web site about the Dorset and East Devon sea side. In the Netherlands, local museums and archives cooperate in Web showcases which display highlights of regional cultural heritage (for example, Collectie Utrecht). These Web sites tend to present historical processes as narratives composed of text and images, with links to collection elements. They have entries on themes, time periods and places, and interactive maps to facilitate selections. A more media-rich variant is the on-line exhibitions which combine clickable maps, animation, video and audio to create a more immersive experience. Some fine examples are presented by the Arctic Studies Center. In Vikings: The North Atlantic Saga the concept of text-plus-images still dominates, but documents are enriched by audio and video, and are made accessible through clickable stops on a journey map. The high end comprises the Flash-based visual narratives like those we may find in the portfolios of American studios, like Terra Incognita and Second Story. Here, the emphasis on multimedia and interactive experience is even stronger. In Congo Trek, a co-production by Terra Incognita and National Geographic, one can hike with biologist Michael Fay across central Africa by moving a magnifier window over a digital map and by clicking places to read a dispatch from that location. Digital videos about forest life are held together by clickable 360 degrees Shockwave panoramas. In Second Story’s Monticello about the home of Thomas Jefferson, an integration of multimedia content is realized through a feature-filled interactive map of the plantation, a comprehensive database of images, and immersive 3D representations of the house (Johnson, 2005). The category of gateway portals shows a sliding scale from hyperlinked illustrated texts to highly integrated multimedia presentations. A question presents itself: What role do multimedia techniques play with regard to information integration? Adding just more images, animations, or videos will not work. However, appropriate usage can strike the balance between comprehensiveness and conciseness. Where a hierarchy of hyperlinked texts becomes easily a burden, a varied mixture of multimedia views on the same subject may create a compelling experience. These views (topics, in terms of our model) can be connected by interactive images that function as visual skeletons. Experience, a narrative-driven layer with emotionally engaging and entertaining elements. Exhibit, the majority of interpretive and educational content in a mixture of linear and non-linear modes. Here, visitors can explore topics and themes. Research (or archive), comprising the exhibition sources, like historical documents, works of art, etc. There are two additional key elements in the model: multiple entry points, which give different audiences access to the layer of content that best meets their needs, and connecting story lines encouraging visitors to follow a theme or topic between the layers. In our own research project, the Cultural Landscape Explorer, we have experimented with integrating and presenting content along the lines described above. We have built an experimental portal Venster op de Vecht (http://www.vensteropdevecht.nl/), which covers the cultural landscape of the river Vecht, a small river in the Rhine-Meuse delta near Utrecht, with medieval castles and 17th and 18th century stately homes on its banks, and peat lands on both sides. The portal can be classified as a gateway and contains – on purpose – content with a varying degree of integration and a wide range of presentation modes; e.g. simple illustrated HTML documents connected by hyperlinks, an innovative guided tour based on Google Maps, as well as high-end visual narratives. Our findings show that cultural landscape content as described by our reference model (Figure 1) can be mapped also into the on-line exhibition model such as the one outlined above. Events: these, in particular their cultural evidences, form the points of interest which are suitable for attracting visitors’ attention. This is the experience level. One successful way of presentation is a flight over the landscape” as in our guided tour based on Google Maps (cf. also Terra Explorer: http://www.skylinesoft.com/). Each stop has a popup balloon with pictures, and some have video fragments. A short text with hyperlinks refers to more detailed information elsewhere in the portal. Here, both the Google map and the balloon content act as connectors. Other entry points are map-linked slide shows with photos about a particular area. Processes: it is tempting to visualize processes primarily through a thematic map or animations, as with a historical GIS. Initially, we did this, for example, with the interplay between land and water in the peat lands. However, it became clear that to be easily understood, this type of presentation required more text and pictures. 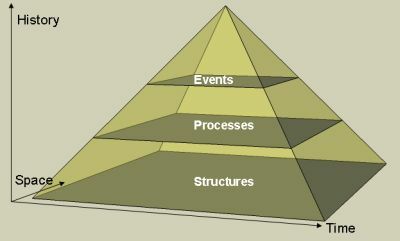 The full presentation of a process will take elements from all three levels (events, processes, structures). In our case it evolved towards an on-line exhibit: text slides with pictures and historical maps combined with Flash-animations, mixing a linear story with explorative visuals. Connections are made through text that refers to other topics, and through clickable maps that act as skeletons to which other topics are linked. Structures: the atlas, with both modern and historical maps, forms the archive section of our portal. Much of the material is still underutilized and is waiting to be better integrated with the process and event layers. Helping users to read and to understand a cultural landscape requires more than just linked content; the content must be also self-integrated. The model we propose helps to illustrate why experiential Web applications with elements of both historical GIS and visual narratives provide best practices for supporting information integration. Based on quite different philosophies but both enabling exploration of underlying collections, historical GIS and visual narratives are complementary approaches which can very well be combined. So far, we have not found examples that did so on an extensive scale. Google Maps and interactive Flash maps are the light variants of geovisualization, and can be added to portals of any type. But the effect of offering these techniques will be much greater when applied to a presentation that provokes visual and associative thinking. The content needs to be staged not in the linear way of a book, but in an explorative and multi-dimensional visual space. Such a presentation is highly applicable to portals of cultural landscapes. Barker,G.(1995). A Mediterranean Valley: Landscape Archaeology and Annales History in the Biferno Valley. Leicester: Leicester University Press. Braudel, F.(1966). La Méditerranée et le monde méditerranéen à l’époque de Philippe II, 2nd revised ed. Paris: Armand Colin. Braudel, F. & S. Matthews (1982). On History. Chicago: The University of Chicago Press. Breure, L., J. van den Berg, A.G.L. Spruit, & J.B. Voorbij, (2006). Visualizing cultural landscapes, in V.P. Guerrero-Bote (Ed. ), Current Research in Information Sciences and Technologies. Multidisciplinary Approaches to Global Information Systems. Proceedings of the I International Conference on Multidisciplinary Information Sciences and Technologies, Merida (Spain), 598-602. Clark, S. (Ed.)(1999). The Annales School: Critical Assessments. London, New York: Routledge. Hufton, O. (1986), Fernand Braudel. Past and Present, 112 August, 208-213. Iannone, G. (2002). Annales History and the Ancient Maya State: Some Observations on the "Dynamic Model". American Anthropologist, 104.1 March, 68-78. Lai, C. (2004), Braudel's Historiography Reconsidered. Lanham, Md. : University Press of America. Rönnby, J. (2007). Maritime Durées: Long-Term Structures in a Coastal Landscape. Journal of Maritime Archaeology, 2.2 December, 65-82. Scazzosi, L. (2004). Reading and assessing the landscape as cultural and historical heritage. Landscape Research, 29.4 October, 335-355. Taylor, K. (2003). Cultural landscape as open air museum: Borobudur world heritage site and its setting. Humanities Research, 10.2, 51-62. Ucko, P. (1999). The Archaeology and Anthropology of Landscape: Shaping Your Landscape. London, New York: Routledge.